This booklet brings together the more readily available information concerning those mills lying within Merton and Mitcham, to consider the factors behind this sudden emergence of the industry in the area and, perhaps, to encourage further work by others whose knowledge lies beyond the borders of these two parishes. 24. Surrey Record Office. Court rolls of the Manor of Reigate. data for this booklet, and his helpful comments on reading an early draft. errors which otherwise would have passed into print. engraved “with many additions” c. 1693. Wallace of the John Innes Society, in a personal communication. 9. Surrey Record Office. Land tax records, Merton. The spelling of the name varies considerably. Merton als. Marton in the County of Surrey” 63/719 S.505. S.R. Gardens, Colliers Wood, in a personal communication. Advertiser: Letter from G. A. Hannaford, 11 Raleigh Gardens, Mitcham. alloyed with tin, bronze have been known since the 3rd millennium BC. intention of promoting the growth of indigenous non-ferrous industries. Company of Lower Redbrook in 1691.
than in more favoured parts of the country. the river at Wandsworth and then transported upstream by road. mill, and which were still in operation as a leather works until 1960. From the foregoing notes, incomplete as they are, a pattern emerges. of the collapse of all but the two larger mills. mills inherently risky ventures, but would also have restrained expansion. ensure continuous working was of course common to all mill operators. Thoyt paid £2 for the same privilege.Thoyt paid £2 for the same privilege. William Thoyte was described as a “coppersmith of Whitechapel”. explained), also relied heavily on the skills of foreign workers. lead and copper at Melincryddan near Neath in South Wales in 1707.
of the copper milling venture at the end of Willow Lane. course of river as it had done since the early Middle Ages. Lysons, the historical topographer, who commented in 1792 that ” …. weatherboarded structures made up a complex assemblage of buildings. a paddock for the horses totalling two acres in extent. stream the river Wandle” is interesting for the additional detail it provides. and Wimbledon Railway, authorised on 29 July 1864 (27 & 28 Vict. in Carshalton” can all be found without difficulty on the 25-inch O.S. by buildings marked as “Mitcham Mill”. Redbrook in about 1691, and it seems likely the two were related. .. (which) .. we can identify .. as at the Butter Hill and Shepley sites. other was presumably that which we have seen was located at Wimbledon. appears on that of 1894-96, where it is marked as ‘Mill Siding’. 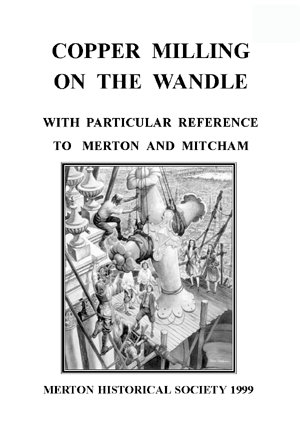 This entry was posted in Publications, Booklets, Publications and tagged in 18-century Merton, 19-century Merton, georgian mitcham, late georgian mitcham, merton, mills, tudor&stuart mitcham, victorian mitcham, wandle.